Paradise Lakes and Caliente are the only nudist communities with Condos and Villas. 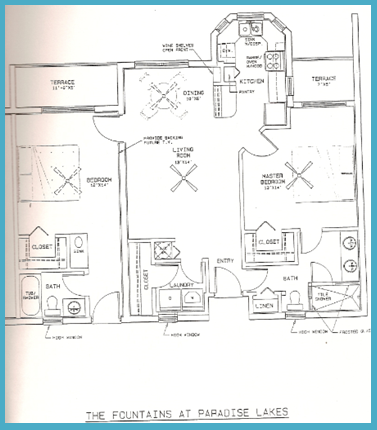 Some of the floorplans shown below are of poor quality. When I can locate better quality copies I will replace them. I have been able to display all the condos and villas with the exception of buildings 1 thru 4 in phase 3. Those drawings that are available are compressed from very large and highly detailed prints that when reduced to computer display are totally unreadable. Never the less, we have the rest and they are useable. These and the notes we have added should give you a very good idea of each unit. 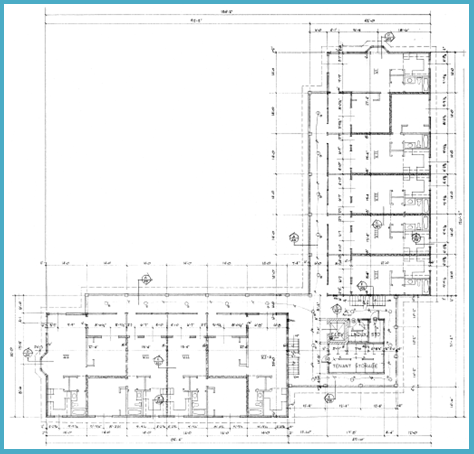 PLCA – Paradise Condo Assoc. Vacation Condos 456 Sq. Ft. This floorplan is of the “500” building. Phase 3, A.K.A. The Key West Condos. It is a 3 story 27 unit building with an elevator located at the crux of the building. There are 3 floorplan styles; 1) a studio with 392 square feet, 2) a one bedroom at 588 square feet, 3) a larger one bedroom at 724 square feet. All have the same kitchen and bath arrangement. The end units away from the elevator are the largest units. The bottom left to right section is all one bedrooms (2) with the exception of the one at the bottom left corner of this drawing. The top right corner shows a (3) unit with a (2) next to it and the rest are studios (1).